In a follow up to the award-winning surveillance thriller, Season Two of Orwell explores power and democracy in a post-truth world. 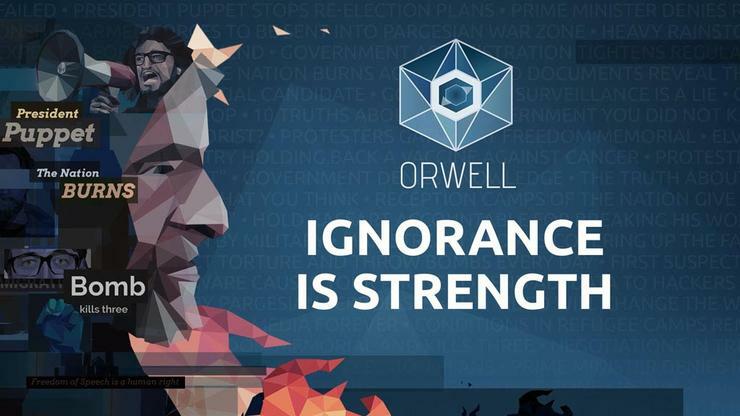 Developer, Osmotic Studios, and indie label, Surprise Attack Games have announced the release of Orwell: Ignorance is Strength. Inspired by the rise of fake news, the social media echo chamber and the death of “truth”, Orwell: Ignorance is Strength puts players in the shoes of a government official in a top-secret department of the Orwell program. Given the power to both uncover and fabricate “the truth”, players must decide for themselves how far they will for in the service of their country and whether the truth is sacred or ignorance is strength. The first season of Orwell was both commercially successful and critically acclaimed, winning multiple awards and receiving prestigious nominations including the IGF Excellence in Narrative and an Honourable Mention in the IGF Seamus McNally Grand Prize. Orwell: Ignorance is Strength takes place in parallel to the events of the first season, but this time the player takes on the role of an insider with access to additional features of the Orwell program. Ignorance is Strength brings a darker tone and introduces new tools that provide the player with more control over how the investigation unfolds and even the ability to influence public opinion directly.